The main assumption underlying the shape models we study in this course is that the shape variations can be modelled using a normal distribution. In this article, we summarise the main properties of normal distributions and show how they manifest themselves in shape modelling. In case you are not familiar with the concepts described here, we highly recommend that you spend some time studying them, as this course relies heavily on these concepts (you find some pointers to literature in the Glossary). 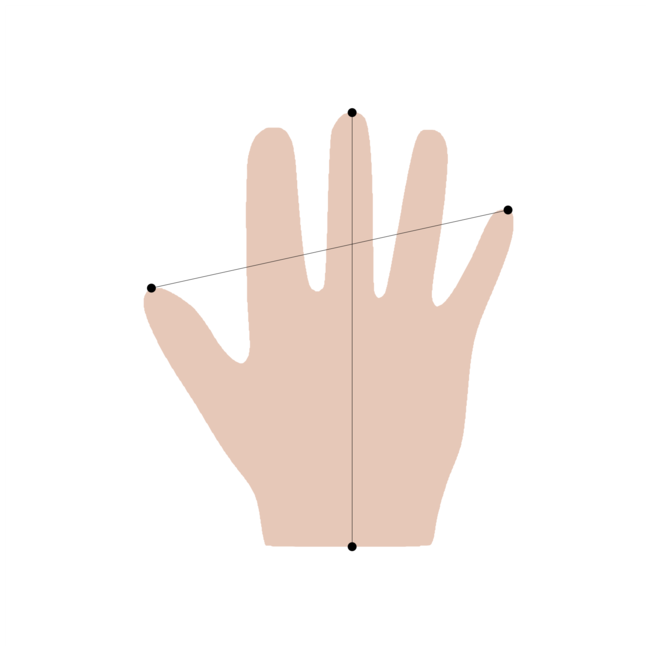 The running example in this article is a simple model of a hand shape which is described by only two parameters: the length and the span (see Figure 1). We start by modelling the length. Our main assumption is that the length follows a univariate normal distribution. Figure 2: the density function of the univariate normal distribution with and (left), (centre) (right). The normal distribution is symmetric around the mean and it assigns a non-zero probability everywhere (cf. Figure 2). The variance determines how far the values are spread around the mean. The further away a value lies from the mean the less likely it becomes. The probability of observing a value that is outside of an interval of is less than . The normal model captures our assumption about the length of a hand rather well. There is an average around which most values are distributed. The possibility of observing unusually long or short hands remains, but the more the observed length deviates from the mean, the less likely we are to ever see such a hand. Figure 3: histogram for the span and length obtained from 169 measurements. Figure 3 shows a histogram obtained from 169 hand measurements and the normal distribution estimated from the data. We see that the normal assumption is indeed reasonable for length and span. To define the distribution, we specify the mean and variance for the span and and the length and as well as the covariance . The covariance describes the coupling between the variables. If , it means the two variables are independent, otherwise we know that the values are correlated. In our case, it is intuitively clear that the span and the length of the hand are correlated, as both are related to the size of the hand. Two distributions that can be derived from the bivariate normal distribution will play a very important role in this course. The first is the marginal distribution, which gives us the distribution for (or ) separately. The marginal distribution for is the distribution we obtain if we do not know anything about the value of . It is simply the univariate normal defined if we drop all variables that are not related to , i.e. . The second important distribution is the conditional distribution . It can be shown that also this conditional distribution is a univariate normal distribution. It models the span given that we know the length . 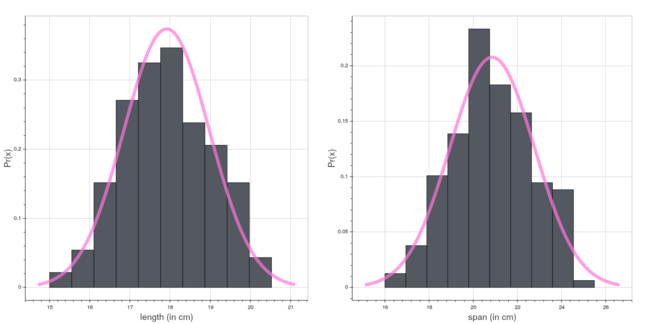 As we assumed that span and length are correlated, the variance in the conditional distribution should be smaller than in the marginal distribution, where we do not assume anything about the length. The diagonal entry defines the variance of the variable , whereas the entry defines the covariance between and . A valid covariance matrix is required to be symmetric and positive semi-definite. The marginal and conditional distributions can be defined also in this more general case. They are both multivariate normal distributions themselves whose parameters can be computed efficiently using closed-form formulas. We will discuss the exact formulas later in this course.